In a setback to the ruling Bharatiya Janata Party (BJP) in Karnataka, its estranged strongman and former Chief Minister BS Yedddyurappa today resigned from the party’s primary membership. All BJP leaders from Yeddyurappa’s Assembly constituency Shikaripura in Shimoga district have also resigned to join the new political outfit Karnataka Janata Party which will be launched by Yeddyurappa in Haveri on December 9. Yeddyurappa loyalist ministers and MLAs, however, have stayed put with the BJP. It means there is no immediate threat to the Jagadish Shettar-led government in Karnataka. As it was planned, Yeddyurappa announced his decision to quit during a rally at the Freedom Park in Bangalore today. Stating he had been back-stabbed, Yeddyurappa said he was leaving the party, to which he had given 40 years of his life, with a heavy heart. 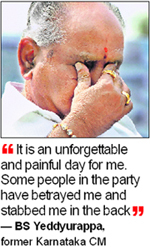 Without naming anybody, a teary-eyed Yeddyurappa said some state leaders have stabbed me in the back. He vowed to defeat the BJP. From Freedom Park, Yeddyurappa along with his supporters went to the Vidhana Soudha in a procession and submitted his resignation to Speaker KG Bopaiah. Following Yeddyurappa’s resignation, the BJP now has 118 members in the 225-strong Assembly, whose term ends in May next. Yeddyurappa, who maintains that he does not want to rock the boat of the present Chief Minister Jagadish Shettar, a fellow Lingayat caste member whom Yeddyurappa has helped become the CM, claims that at least 50 BJP legislators are keen on joining his party. BJP chief KS Eshwarappa said while Yeddyurappa’s severing of ties with the BJP was a blow for the party, it was a far bigger blow for Yeddyurappa himself.